Brighten up your patio space with the beautiful Dockside gold 3 pc 35 in. 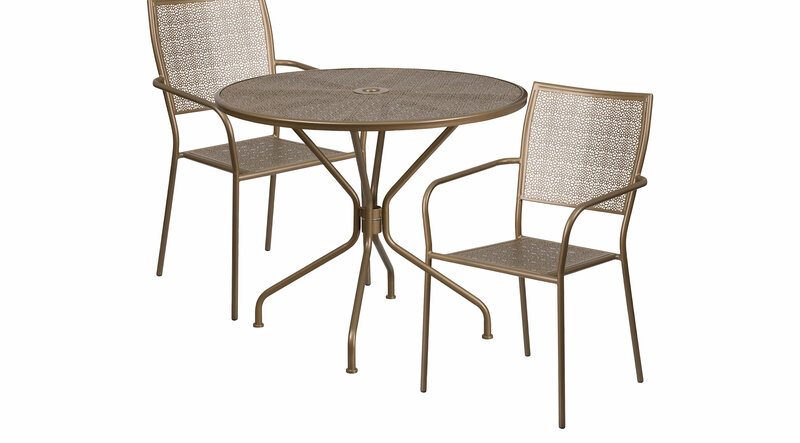 round patio set. This colorful set will enhance your bistro, cafe, restaurant, hotel, or home patio space. The top includes an umbrella hole (umbrella not included). The two patio chairs stack for storing. The frames are designed for all-weather use, making it a great option for indoor and outdoor settings. For longevity, care should be taken to protect from long periods of wet weather. The possibilities are endless with the multitude of environments in which you can use this table for both commercial and residential spaces. Includes one 35 inch round table and two square back chairs.